Controversial Blogger Njoki Chege has done it again and this time 28 year old Billionaire is on the spot on Njoki's sentiments. Following the current trend of Steve making headlines on social media and the blogosphere for his lavish lifestyle as the lad has been exercising his financial muscles by dishing out millions of money in parties including his birthday which he parted with a clean Ksh 10million. Here is what Njoki chege had to say. 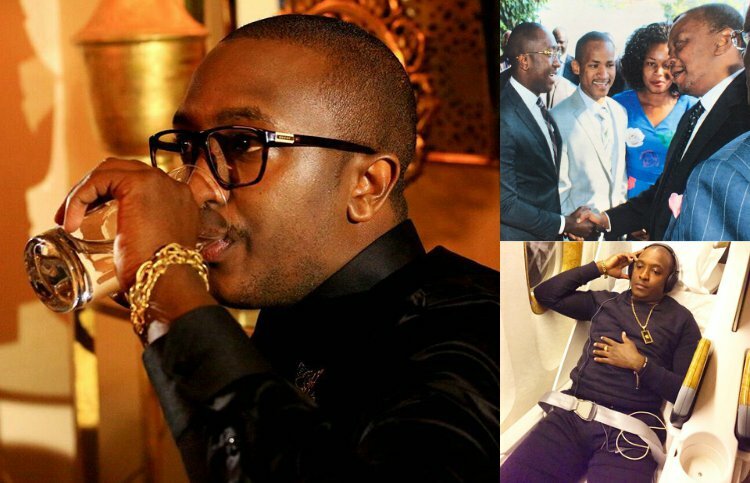 There is an impressionable young man by the name Steve Mbogo who claims to be worth Sh13 billion. This young man, my dear readers, claims to own twelve 4-star hotels in Kenya, over 30 apartment blocks and a flight training academy at the Wilson Airport. He has also sensationally claimed that he was ranked among East Africa’s richest young men under 30 years by Forbes magazine. Now friends, I have searched far and wide in the World Wide Web for that article. The only article I found was one about 30 most promising young entrepreneurs and our little Stevie boy was nowhere near that list. He claims he has presented academic papers at several Ivy League universities, including Harvard University. All these he has achieved by the tender age of 28 years. His website, which he has since deleted, is a cacophony of inconsistencies with a fake profile lifted from a local professor’s resume on a university website. This young man, my friends, wants to run for president in 2017 and thinks he can unseat the current president. You wish! He may be a pretty boy, but he doesn’t fool me like he did the rest of you. Steve Mbogo is nothing more than a crossbreed of a fake wannabe with rudimentary grasp of English. His speech is incoherent, probably because he thinks first in his mother tongue and then translates those thoughts into poorly constructed English sentences. You do not need to be an FBI analyst to see through his fakeness and see him for the broke, struggling young man that he really is. To claim that Steve Mbogo is a hardworking young man is to defile the true meaning and spirit of word ‘hard work’. To say that Steve Mbogo is a successful young man is to insult all the successful people in this country — I included. Methinks this Steve Mbogo is just a bottom feeder living off the hype of an atrocious act of deception in a bid to get the attention of the big boys in this town. I think he is a student of the ‘fake it till you make it’ school of thought where an individual creates an illusion of success and wealth to trick people into believing in their fake success. The worst bit, and this is where my story begins, is that local radio and television stations have taken his bait and are inviting him to their morning talk shows to give tips on entrepreneurship and wealth creation. I always knew radio decision makers were never the smartest tools in the box, but this is a new low. To promote falsehoods and heresies by a deluded loser is the epitome of failure and a classic case of ‘how not to do media’. It is disgusting that morning television shows would invite this chap to waste precious airtime justifying why he cannot pronounce the word ‘Grand Prix’ properly. It is absolutely ridiculous that editors would waste newsroom resources to send reporters and cameramen to meet this deluded loser at the airport coming from Abu Dhabi. In the usual media fashion, we have allowed ourselves to be used by a ne’er do well to promote his fake ideals with acres of coverage, all for free. This is how we end up with politicians who take us for a ride because we are so stupid that we believe in a young man who should be sitting at the corner for plagiarism and fraud. This is how we end up with leaders who steal from our public coffers to bankroll grand lifestyles. The media have created this monster that we call Steve Mbogo and we must undo this mistake before it is too late. I am not hating. I have never met Steve Mbogo and I do not even wish to touch him with a ten foot pole. It is nothing personal; it is purely for cerebral hygiene purposes, if you will excuse me. Hey Steve, this is for you. Remove your fake ‘Dr. Dre’ headphones, I am talking to you boy. Wealth is quiet. Wealth is silent. Wealth does not announce itself and it certainly does not blow its own trumpet. I guess if you were really wealthy, you would know this by now. You would not disturb and prick us with your nonsense. You are neither rich nor wealthy and you do not even deserve to sit on the council of boda boda riders. Go home, Steve. Apologise to your mother for publicly embarrassing her. After that, go to school. Learn English and then you can start thinking about becoming an entrepreneur. Let this be the last article media will ever run about this wannabe. Let this be the last conversation we will ever have about Steve Mbogo. And please, for God’s sake, do not invite him to your talk shows. I would rather eat my shoes than stand another Steve Mbogo broadcast. Finally, Steve Mbogo, would you like to sue me for libel and defamation? Mmmmh! After Googling the meaning of these two hard words, fill this form, pick a coupon and wait for your turn at the lounge with the fake daddy and mommy pastors you look like. Did I hear somebody shout Riswa! ?